Kathleen Harrison is an ethnobotanist, artist, and photographer who researches the relationship between plants and people, with a particular focus on art, myth, ritual, and spirituality. Harrison teaches in Hawaii, California, and the Peruvian Amazon. She has done fieldwork in Latin America for 30 years, and is the President and Projects Director of Botanical Dimensions, a non-profit foundation devoted to preserving medicinal and shamanic plant knowledge from the Amazonian rainforest and tropics around the world. Harrison co-founded the organization in 1985 with former husband, the late Terence McKenna. In her work with Botanical Dimensions, she has done fieldwork and supported indigenous projects in Mexico, Peru, Ecuador and Costa Rica. Harrison is a popular lecturer at conferences, seminars, and workshops; she continues to document the many faces of ethnobotany with photographs, which she combines with stories in her slide presentations. Harrison is a widely-published illustrator, and enjoys teaching people how to see and draw the plant world. 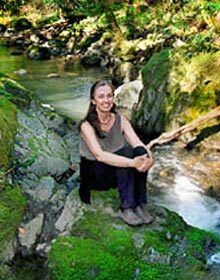 She is based in Northern California, where she is active in local watershed restoration. She reports that she is lucky to be the mother of two wonderful grown children, who make her life even richer.